Backpacking is always a good activity for people who love outdoor adventures. It is a low-cost independent form of traveling with the use of backpacks that are easily carried for a long period of travel. Wilderness adventure is one backpacking activity. Camping is always a good time for family and friends. It is an outdoor activity that involves an overnight stay away from home in a shelter, such as a tent. Whether it’s backpacking or camping you are planning to do, it is important to bring a good tent for camping. It should be big enough for the number of people who will stay inside the tent, comfortable enough to sleep in, and light enough to carry over long distances. When choosing a quality tent, examine the seasonality and key features such as the doors, peak height, cabin styles, tent floor height, rain flies, and others. They should have the necessary features to make camping comfortable and convenient. Are you looking for a lightweight backpacking tent? If you have the budget, consider the Geertop 4 Season 2-Person 20D Alpine Tent. It is ideal for camping, hiking, climbing, and traveling because of its lightweight feature. It is also built with a living room, a unique style that ordinary tents do not have. You’ll love the Geertop 4 Season 2- Person 20D Alpine Tent once you become familiar with its features, most of which can’t be found on other tents. The most unique feature is the capability to be used for 4 different seasons—winter, spring, fall, and even rainy season. It has a built-in snow skirt suitable for cold, snowy weather, and mesh areas on the insides to allow airflow during warm seasons. The Geertop 4 Season 2- Person 20D Alpine Tent is lightweight and can be conveniently carried, even on difficult hikes. It weighs 6.2 pounds and its packed size is just about 6.3” x 6.3” x 6.18”. It is made with ultralight 20D PU8000mm waterproof silicon-coated nylon which makes it very light, compact, and water resistant too. It can accommodate up to 2 adult campers with a lot of space. It has a personalized compartment, provides warmth during the cold season, while still keeping the whole tent breathable. This personalized compartment also serves as a living room for added space. Campers will feel safe and comfortable because it is a high-quality alpine tent which resists strong winds at high altitudes. It has aluminum poles for superior stability and strength. The crossed aluminum pole design adds stability to withstand strong winds. 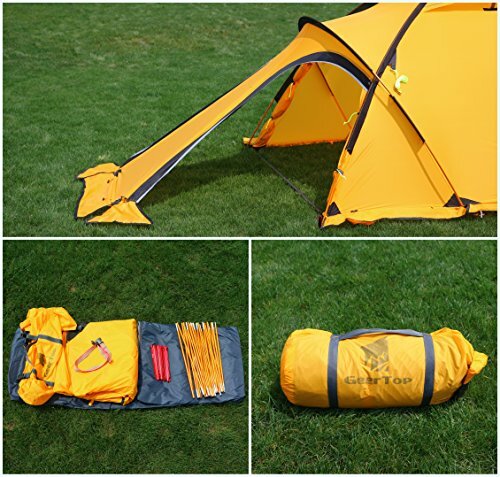 Included with the Geertop 4 Season 2-Person 20D Alpine Tent package are flysheet, storage pocket, aluminum tent pegs with carry bag, folding aluminum poles with carry bag, four reflective ropes, and a large carry bag for all the tent parts. Just like any other product, the Geertop 4 Season Person 20D Alpine Tent comes with pros and cons. But what makes this tent a good one is that it has more pros than cons. 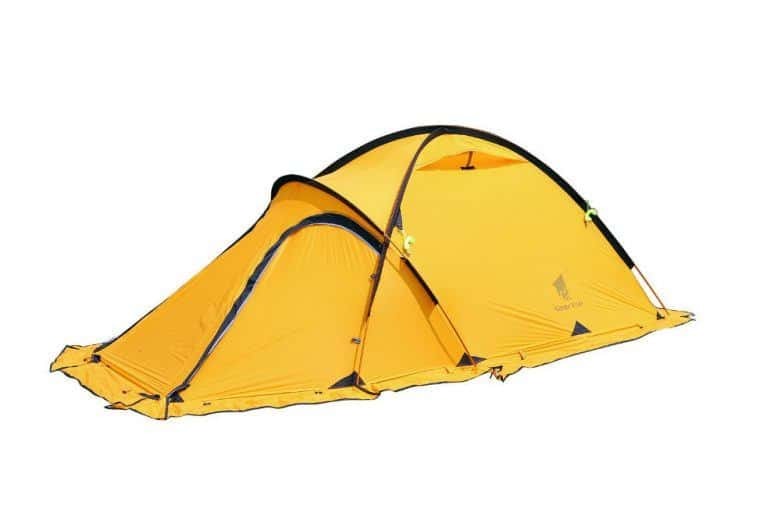 These pros and cons are based on the tent’s features, and the reviews of people who have bought, and have been using it. Multi-seasonal. It has a built-in snow skirt and mesh areas so that it can be used during snowy days as well as hot weather. It is very lightweight and compact with its 6.2 pounds, making it very easy to carry. Plus, it comes with carry bags for all its parts such as for the aluminum poles, reflective ropes. It is a complete package. It comes with essential parts such as flysheet and storage pockets. It has a living room that adds space inside the tent, as well as added ventilation during hot weather. A few users were too hot inside the tent on hot days. The Geertop 4 Season 2 Person 20D Alpine Tent can be small for two large adults. The verdict on the Geertop 4 Season 2 Person 20D Alpine Tent is that it is a cost-effective tent that is good for two adults. It is made of high-quality materials that make the entire tent sturdy and strong against different weather conditions. While it has a few drawbacks, its advantages and features compensate for them.